Perhaps the reason companies cite the most for wanting to use social media is to ‘Build Awareness’. They want to get the word out via social media about who they are, and what they do. The thinking is that if people know who we are, they can and will buy from us. There’s a fundamental flaw with this line of thinking: You are selling to a group of people who don’t know who you are, so by extension, they don’t know why they should buy from you. Yet companies do this every single day, and are confounded by the fact that their social media strategy isn’t driving sales. So if you want to create a social media and content strategy that drives sales, when you create content you have to consider whether or not the customer is ready to buy. And if they aren’t, you need to understand what type of content creates the most value for them, and at the same time puts them in a position where they ARE ready to buy from you. The concept of understanding the Buyer’s Journey has become a hot topic in regards to digital marketing in recent years. The idea is that most customers take a specific path before actually purchasing a product. What you want to do is create a content strategy that allows you create the appropriate type of content for your customers at each step of this journey. 1 – Unaware, AKA Who the hell are you?. The buyer has no idea who you are, or why they should want to listen to you, much less buy anything from you. When companies talk about using social media to ‘Build Awareness’, this is the group they are targeting. 2 – Slightly aware and slightly interested. This group has begun to understand who you are, and can start to see how your products and services can fit into their lives. 3 – Interested and considering buying. This group knows who you are, knows what you sell, and knows how those products and services fit into their lives. Now they are trying to decide who to buy from, you or a competitor. 4 – Ready to buy. Take my money! Now the problem is that most companies create a social media strategy that’s based on ‘Build Awareness’, and then create content that’s aimed at customers that are at Stage 4 (Take my money!) when the reality is since they have an awareness problem, the company’s customers are going to be at Stage 1 (Who the hell are you?). So this strategy is doomed to failure from the start. So let’s look at each stage and the appropriate content you should create to not only give the customer the content they need, but the content that will move them to the next stage in the buying process. Stage 1 – Unaware, AKA Who the Hell Are You? At this stage, the customer has no idea who you are, or why they should care. So any company or product-related content you create for this group is likely going to be completely ignored. What does that leave you? Obviously if you can’t create product-related content or company-related content, the only thing left is customer-centric content. You create content about the customer you want to connect with. More specifically, you create content that focuses on common Passion Points that connect the customer and your company. Wait, what the hell is a Passion Point? I’ve blogged about the power of Passion Points before. Basically, a Passion Point is an idea or theme or belief that relates to your company and products, that your customers feel passionately about. For example, dog owners are passionate about making sure that their dog is happy and healthy. So Pedigree focuses its marketing and content on these Passion Points, happy and healthy dogs. As a result, dog owners are drawn to Pedigree because the brand is focusing its marketing on ideas and beliefs that dog owners are passionate about. Notice these topics are focused solely on the dog and the dog owner. Each post is also connected to either the ‘Happy Dogs’ or ‘Heathy Dogs’ Passion Point. By focusing strictly on the Passion Point that is important to the dog owner, Pedigree can create content that interests them. And that’s the starting point. On the other hand, if Pedigree would have written a blog post that was nothing more than a digital coupon for 55 cents off a can of its dog food, that content would have been ignored because the dog owner already has a source of dog food. But by switching its focus to creating customer-centric content that’s married to Passion Points that are relevant to the dog owner, Pedigree has gotten their attention. Stage 2 – Slightly aware and slightly interested. At this point, the content created in Stage 1 has resonated with the customer, and they are paying some attention. But you still aren’t at a point where you should create content that directly sells your product. You want to shift your focus slightly from Stage 1, where you focused solely on creating content that connected to a Passion Point that interested your customer. Now in Stage 2, you want to create content that connects those same Passion Points to your brand. In the first step you connected these Passion Points to the customer, now in Stage 2, you want to connect those same Passion Points to your brand and its products. “Want a Healthier Dog? Science says these five vitamins will boost your dog’s immune system.” And the post itself could explain the five vitamins, then show how Pedigree dog food includes all these vitamins. “Support Pedigree’s Adopt-A-Dog Program and connect loving families with loving dogs.” This post explains how Pedigree supports dog adoption and shelter programs around the country. “Wet or Dry: What type of food is the healthiest for your dog?” This post gives dog owners vital information on how to set their dog’s diet, but also give Pedigree an opportunity to explain how its wet and dry dog food can help dogs have healthier diets. Notice these blog posts are still connected to the happy and healthier dogs Passion Points, but this content also makes the connection between Pedigree and these Passion Points. It’s also helping readers to understand what Pedigree and its products are doing to help improve both the health and happiness of dogs. Stage 3 – Interested, and considering buying. At this point, the customer has read your content, and has made the connection between the Passion Points they care about, and your brand. They are interested in buying your products, and as a result, want more product-specific information for comparison purposes. Going back to the Pedigree example, this could be a case where a potential customer is coming to your blog or website looking for the exact ingredients that your dog food contains. Maybe they are looking for these vitamins or these minerals. The point is that they want detailed, product-specific information because they are informed customers that are ready to buy. Stage 4 – Ready to buy, take my money! This is pretty self-explanatory, you want to give customers a clear Call to Action for how they can buy your product. If you are selling your product on your blog or website, give them a link to where they can purchase directly. For the Pedigree example, this could include a link on where they can buy dog food on the main Pedigree website, or a link to where they can find a local dealer or grocery that sells Pedigree products. Note: If you want to use social media to sell your products, you have to actually give customers a way to BUY your products! I know this sounds simple, but think about it: If you were a customer and came to your company’s website, how would you buy a product or service? How simple or difficult is the buying process? Are you actually selling anything directly on your website? This alone could explain why you are having difficulty selling with social media! 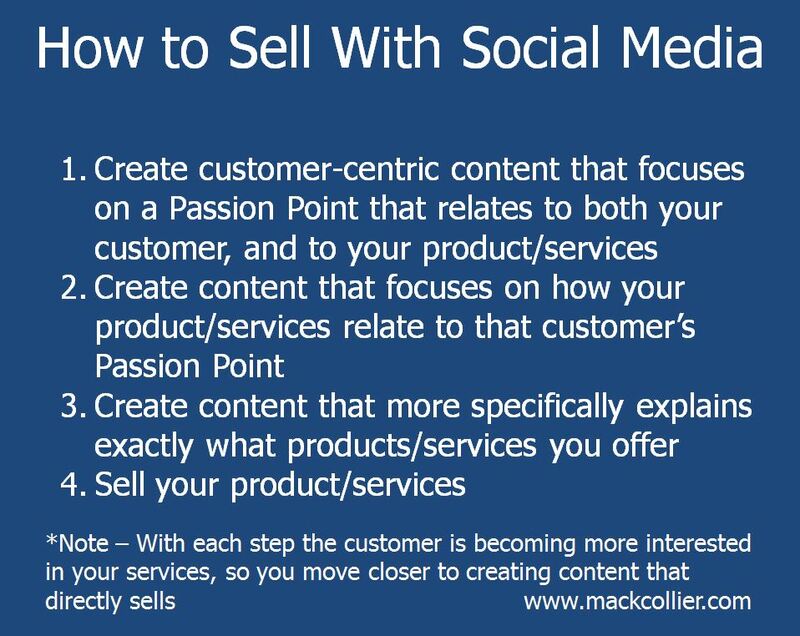 Want to know How to Sell With Social Media? Here’s all 4 steps! Thank you Jessica, that’s very kind of you! 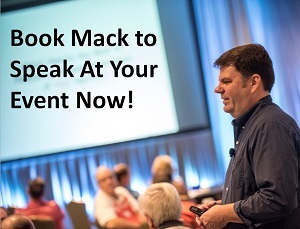 So many companies want to sell right out of the gate with social media, and it rarely works! Better to create relevant content that connects to the Passion Points of the customer then go from there.